Saint Michael the Archangel - 6 min. Vision of Hell - Sister Faustina's Vision 12 min. "IN May there was a great deal of smallpox, and at the same time the water of St. Michael was discovered." These words in the Náhuatl [Aztec] language, constitute one of the most ancient testimonies about the apparitions of St. Michael in the state of Tlaxcala. They were found in an ancient manuscript, bound in parchment, ill-treated and broken in places. It was written by an anonymous chronicler at an unknown date, who summarized in his native language the most important events before and after the Spanish conquest. The last owner of the manuscript, Juan Marcos, an Indian cantor of Natívitas, presented it in 1676 before the ecclesiastical judges, as part of his declaration. The present booklet is a translation of a book published about St. Michael’s well, with the permission of the bishop of Tlaxcala. Father Francisco Florencia in 1692 published the best history that exists about Saint Michael’s Well, and he furnishes the historical framework of that epoch. "It was the year 1631. In the see of St. Peter, Rome, was Pope Urban VIII; the scepter of empire was in the hands of Philip IV; the Viceroy of New Spain was Don Rodrigo Pacheco, the Bishop of Puebla was Don Gutierre Bernardo Quiroz: all these dignitaries and leaders being superior by reason of their nobility, endowments and talents." The place of the miracle was the ravine of Tzopilatl, near the town of San Bernarbé, in the jurisdiction of Natívitas. "You must know, my son, that I am Saint Michael the Archangel; I come to tell you that it is the will of God and mine, that you should tell the neighbors of this town and of its environs, that in a ravine that forms two hills, facing this place, they will find a fountain of miraculous water for all illnesses, which is beneath a very large rock. Do not doubt what I tell you, nor neglect to do what I command you." Diego Lázaro remained perplexed and confused after this vision, and feeling that no one would believe him, for he was a poor Indian, he determined to keep silence and to forget the command of Saint Michael. After this first apparition the Franciscan Fathers of Natívitas saw with good eyes these miraculous manifestations; they counseled Diego Lázaro and granted him their decisive support. Even before the civil and religious authorities gave their approval, the Franciscans made frequent allusions to these apparitions in their sermons, and organized processions with their students and the citizens, to the fountain, and celebrated Masses in that place. THE second and most grandiose apparition happened on the night from the 7th to the 8th of May, 1631. Due to his disobedience, Diego Lázaro fell gravely ill, with a mortal cocolixtli or burning fever, that carried him to the gates of death. He was already agonizing inside his wigwam (Indian hut), surrounded by his relatives, who were helping him to die well, when suddenly, a brilliant light shone through the window, like the light of a bolt of lightning, that terrified those present and obliged them to go out fleeing, leaving Diego alone. "Do not fear for my sake, for Saint Michael appeared to me, granted me health, and carried me (I know not how) to a ravine that is near here, the Saint going before me to clear the way. Being in the said ravine, he told me: Here where I touch the ground with this staff, (it was a golden staff that he carried in his hand with a cross on top), is that fountain of water that I told you about, when you went in the procession. Reveal it, therefore. If you do not, you will be severely punished." Then, a light of great brilliance descended from heaven and shone upon the place of the fountain. "This light that you have seen descending from heaven," said the angel, "is the virtue that God communicates to this fountain, for healing and remedy of the sick, and other necessities. Make this known to everyone." As a proof that the vision had not been a mirage or deceit, Diego Lázaro arose in the sight of everyone, totally healed. Counseled by Friar Hernando García Rendón, Guardian of the convent of Natívitas, Diego Lázaro traveled to Tlaxcala to communicate the Archangel’s message to the governor of the natives, Don Gregorio Nacianceno, an important cacique esteemed by the Viceroys, respected and feared by the natives. After hearing his relation, the governor treated him harshly, telling him it was not credible that Saint Michael would appear to a poor Indian, when there were so many clergymen, bishops and nobles that deserved this honor. He ordered one of his officials to investigate the case, and the result was unfavorable. For in this site there had always existed a fountain, and a little lower down, a well of stagnant waters named Tzopiloatl (water of zopilotes—vultures). Because of this evidence, the governor threatened to punish Diego Lázaro, if he persisted in his foolishness. THE harsh answer of the cacique did not discourage Diego Lázaro; rather it served to make him plan a new strategy. When he returned to his town, he, his parents and his wife determined to go to the ravine to become acquainted with the site that the Archangel had sanctified with his presence. The place was a hill divided by a deep ravine or precipice, that the ancients called Tzopilotitlan (place of vultures), and they named the pool of water Tzopi loatl (water of vultures). A short distance higher, they found the spot where the Archangel had placed his staff of gold, covered with a great block of tepetate, beneath which was hidden the fountain. When they arrived at the place, the four of them tried to remove the large piece of tepetate, so large, that some witnesses say it weighed 500 quintales. While they were trying in vain, a young man of beautiful aspect arrived and told them that he could help; when he applied his hands, the large rock was easily moved, and rolled down into the ravine with a great noise. At this instant the young man disappeared. Then they dug with their hands, and thereupon appeared the water from the fountain, clear and crystalline. From what has been said, it may be understood that this fountain already existed, but it had been buried beneath debris. A little lower down, the filtered streams had formed a pool or small lake of stagnant water named Tzopiloatl. It should be known that the water of this fountain did not flow downwards, but on the sides, coming from the east. In the beginning, the devout pilgrims took the clay and rock from the fountain as relics. This earth was sent to many places in the kingdom, even arriving at Seville in the form of lozenges (small cakes), or sometimes they put it in ordinary water to give it as a drink to the sick. The water of St. Michael is limpid, clear and transparent, thin and of pleasant taste, and it does not become spoiled. Another of its virtues is that it is used as a general remedy for evils and to put the malign one to flight. In some cases, the water caused a heavenly joy and sent forth a pleasing odor and a rich fragrance. But it is very delicate and sensitive, to such a degree, that if it is not used well and with due respect, it can disappear or become harmful. "Why are you cowardly and negligent in what I commended to you? Do you want me to punish you in another way for your disobedience? Arise, and be very diligent in making known what I have commanded you." Disturbed by these severe words, he withdrew his dispute with the cacique. He went up to the fountain; he took the water in a vessel or cask, and he went to see the bishop of Puebla, Don Gutierre Bernardo Quiroz. The kind Bishop listened attentively to the strange story of the apparition. He remembered that the Heavenly Father revealed the mysteries of his kingdom to simple people, and as he discovered that the young Indian was sincere, he took leave of him, and promised that he would make an investigation. Moreover, he ordered the holy water to be distributed among the sick of his house and of the royal hospital. Those who drank it afterwards improved or recovered their health. The news of these cures was spread in Puebla, Tlaxcala and other regions, and people began to arrive at the ravine of the miracle from many places. 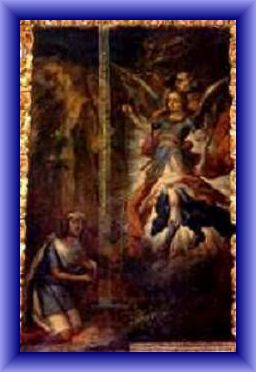 THERE were three investigation that were made about the apparition of Saint Michael to Diego Lázaro. The first was made by order of the bishop Gutierre Bernardo Quiroz, the year following the events. He ordered Professor Alonso Herrera to appear personally in the place, and after having obtained precise information, to approve or disapprove this devotion. Upon fulfilling his assignment, the canon remained completely convinced of the authenticity of the apparitions, and gave his approval with pleasure, and also celebrated a high Mass with a Te Deum on Oct. 29, 1632. Don Juan de Palafox ordered the second investigation with the following decree: "After having visited the site and having informed ourselves that it seems the marvelous things that God has worked by means of the Archangel have foundation, we give a commission to the Licentiate Gabriel Pérez de Alvarado, priest of Natívitas, to investigate this foundation. Given in Puebla, on Dec. 1, 1643." The witnesses chosen were 10, seven Spaniards and three Indians. Among the latter were numbered Andrés Pérez, Diego’s cousin, and his maternal grandmother, Isabel Castillán Xuchitl, 80 years of age. The interrogation was concluded in January of 1644. IT suffices to see the portrait of Diego Lázaro in the church of Saint Michael, that shows him to us young, kneeling, clothed as an Indian, humble and kind, to feel great sympathy for him. He was conscious of his mission and of the difficulties he encountered in order to bring it to completion. He had to arm himself with strength and courage, to convince the "great ones" that Saint Michael had truly appeared to him, who was so small. And he succeeded in doing so with his tenacity. He was born in a hacienda of the town of San Bernabé, and was baptized on Sunday, Sept. 15, 1613. According to the custom among the Indians, about the age of 17 he married Francisca Castillán Xuchitl, and it is not known that they had children. On two occasions he was at the point of death, because of a sickness that came upon him when he did not decide to fulfill the orders of the Archangel. His neighbors related of him that "he had praiseworthy habits; he was silent and modest; attended the classes of Christian doctrine, Masses, and gave good example to everyone with his good conduct." He consecrated the last three years of his short life totally to the service of the holy Prince Saint Michael, and of the sick who came to the fountain. It can even be said that he became a hermit and an infirmarian. He was the janitor of the first small chapel built at the site of the apparitions. He was diligent in caring for the sick; he washed them with the water and clay from the fountain, and he encouraged them with his fervent words. His life was austere and penitent; he spent long hours in prayer, to such a degree, that his life and his virtues are a strong argument of the veracity of his history. A tradition relates that, on the day he died at the age of 20, the bells in the town rang by themselves. AROUND this well, great events began to happen, that made this place famous. Here the first chapel was built in 1631, very simple, for it was only a bower (covering of branches for shade). It was used, above all, for covering the fountain and celebrating Mass, but the place was too narrow, and so above the ravine Diego Lázaro built another, larger chapel that had a thatched roof on beams, and it was very beautiful. 1. They will find a fountain of miraculous water for all illnesses. 2. Do not fear (due to the noise that the demons made when they were dislodged) the efforts of the demons, who know the great benefits that the faithful are to receive in this site of Our Lord, through my intercession. 3. Many, seeing the marvels that are to be worked here, will be converted and will do penance for their sins, and will give thanks to God for his mercies. 4. Those who come here with living faith and sorrow for their faults, with the water and earth from this fountain, will obtain relief in their trials and necessities, and with it will strengthen the sick in the agony of death. 5. "I will help all of you," said Saint Michael to those who removed the rock, and he continues saying it to those who need his help, to free themselves from sin and from their vices. Tepetate: layer of very solid earth, that is cut like hewn stone. Náhuatl: the Aztec language, spoken by about half a million people. Cacique: a chief of an Indian clan or tribe. Tlaxcala ( tlas ka´ la ), the smallest state of Mexico. Pop. (1970) 421,000. 1554 sq. miles. Capital: Tlaxcala. Transportation. The sanctuary is located in Cacaxtla, 10 miles from the city of Tlaxcala. On Sept. 29 and the anniversaries of the apparitions (April 25, May 8, Nov. 13), there are many pilgrims that come from surrounding states. Diego Lázaro and Saint Michael in the lower part of the ravine, at the moment when the water sprang forth, May 8, 1631. The ray of light can be seen that came down from heaven to sanctify the water and to give it the virtue of curing. The first fact we learn concerning this great prince of heaven is that in the mighty combat that took place in Heaven, when the bad angels fell away from their allegiance to God, St. Michael sounded his war cry: Quis ut Deus? --- Who (is) like God? Joined by the good angels, St. Michael drove Satan and his legions from heaven and plunged them into the depths of Hell. St. Michael was the protector and defender of God's chosen people. Now he is the defender of the Church and of all the faithful, whom he defends against the constant assaults of the devil. He is invoked in sickness and most especially at the hour of death, when his all-powerful help is so much needed, for then it is that Satan makes his last and fiercest attack on the Christian soul, seeking with craft and cunning, with fears and despair, to drag it down to hell. We all must die, and we all must be prepared for the fierce attacks of the devil at that dreadful hour. Hence, every Christian should make sure of having St. Michael's help at the hour of death. By invoking his aid in time of sickness. By praying to St. Michael to defend the world against the devil and save us from the awful evils that threaten us. Let us occasionally offer our Mass, Communion and Rosary in honor of St. Michael. The human will of Christ, conforming itself to that of the Divinity, then accepted suffering for each respectively: for the reprobate, as sufficient to procure them the necessary help, if they would make use of its merits, and for the predestined, as an efficacious means, of which they would avail themselves to secure their salvation by co-operating with grace. Thus was set in order, and as it were realized, the salvation of the mystical body of his holy Church, of which Christ the Lord was the Creator and Head. As a ratification of this divine decree, while yet our Master was in his agony, the eternal Father for the third time sent the archangel Michael to the earth in order to comfort Him by a sensible message and confirmation of what He already knew by the infused science of his most holy soul; for the angel could not tell our Lord anything He did not know, nor could he produce any additional effect on his interior consciousness for this purpose. But, as I related above, Christ had suspended the consolation, which He could have derived from his human nature from this knowledge and love, leaving it to its full capacity for suffering, as He afterwards also expressed Himself on the Cross. In lieu of this alleviation and comfort, which He had denied Himself, He was recompensed to a certain extent, as far as his human senses were concerned, by this embassy of the archangel. He received an experimental knowledge of what He had before known by interior consciousness; for the actual experience is something superadded and new and is calculated to move the sensible and bodily faculties. Saint Michael, in the name of the eternal Father, intimated and represented to Him in audible words, what He already knew, that it was not possible for those to be saved who were unwilling; that the complaisance of the eternal Father in the number of the just, although smaller than the number of the reprobate, was great; that among the former was his most holy Mother, a worthy fruit of his Redemption; that his Redemption would also bear its fruits in the Patriarchs, Prophets, Apostles, Martyrs, Virgins and Confessors, who should signalize themselves in his love and perform admirable works for the exaltation of the name of the Most High. Among these the angel moreover mentioned some of the founders of religious orders and the deeds of each one. Many other great and hidden sacraments were touched upon by the archangel, which it is not necessary to mention here, nor have I any command to do so; and therefore what I have already said, will suffice for continuing the thread of this history. During the intervals of Christ's prayer, the Evangelists say, He returned to visit the Apostles and exhort them to watch and pray lest they enter into temptation (Matth. 14, 41 ; Mark 14, 38; Luke 22, 42). This the most vigilant Pastor did in order to show the dignitaries of his Church what care and supervision they were to exercise over their flocks. For if Christ, on account of his solicitude for them interrupted his prayer, which was so important, it was in order to teach them, how they must postpone other enterprises and interests to the salvation of their subjects. In order to understand the need of the Apostles, I must mention, that the infernal dragon, after having been routed from the Cenacle and forced into the infernal caverns, was permitted by the Savior again to come forth, in order that he might, by his malicious attempts, help to fulfill the decrees of the Lord. (from The Mystical City of God, Life of the Virgin Mary, Vol. 3, The Transfixion, by Sister Mary of Jesus of Agreda, 1602–1665). Incredible Miracle: U.S. Marine saved by St. Michael. Historical information about how St. Michael appeared in Italy, France, Mexico and other sites.